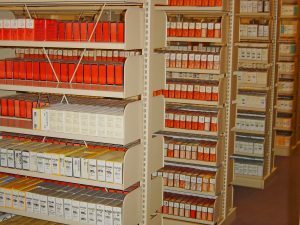 Microfilm and microfiche were once viewed as the gold standard in storing large amounts of data, whether it was preserving documents, photographs, books, newspapers, manuals, and other physical files. Both microfilm and microfiche use the same methodology: take tiny exposures of each page and store them in their minimized version to save physical space. Microfilm stores these exposures in a reel while microfiche uses flat sheets, but otherwise, they are very much the same. Other microforms include super-fiche and microprint, which use the same methodology but are stored on rectangular sheets or cards. 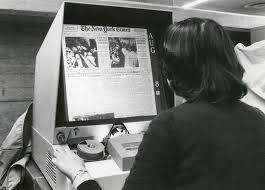 Using a viewing machine like the one pictured here, the microform images are placed into the device and the exposures are magnified on a screen, making them readable. If you’ve seen one of these machines before, chances are it was a long time ago. Microforms are now considered to be very outdated technology thanks to computers and disk storage which allow for more storage capacities and more convenient options. How Do Microfilm and Microfiche Scanning Services Work? Converting the microforms to a digital format makes it easier to view, transport, duplicate and manipulate the data for future use. While newer files are being created digitally, the old data stored in microforms are still relevant and preserving them is a concern many organizations must endure. The original microforms should be stored in an environment that helps to maximize their lifespan. Microforms can deteriorate over time without careful planning, with most complications stemming from natural disasters or unstable climate conditions, such as humidity. Offsite storage facilities for microforms make it easy to keep your data tucked away in climate-controlled environments that are ideal for their preservation over time. Just a low monthly fee is all it takes to keep these original microforms safe while using your digital copies for everyday use. If your business or organization is still holding onto microfilm or microfiche that haven’t been converted to digital, you are running the risk of losing all that data without proper precautions. By scanning them into a digital format, you can access and duplicate them much more easily. To learn more about microfilm and microfiche scanning services or to get a free, no-obligation quote from professionals based in your area, give us a call at (866) 385-3706 or use the request form on this page. You’ll receive quotes within minutes from qualified experts in your area.